The newly redesigned LiteWorld Protective Enclosure is now available through our website at: http://www.liteworldllc.com. The redesigned enclosure features an easy to assemble aluminum frame using a three-pronged knuckle joint that is simple attached using a threaded coupling. The new door hinge design is easy to set up and adjust and the size of the enclosure is still the same. 38″ wide x 32″ high x 30″ deep. It is large enough to fit over a LulzBot TAZ 6 with two spools of filament. The fan on the back allows for maintaining constant temperatures inside and the enclosure keeps little hands away from the hot build platform and extruder. Price is $575.00 plus shipping. Today most schools, libraries and business operations are looking for an enclosure that will provide safety to the people around it but also reduce the levels of noise created by the printer during its operation. The LiteWorld Protective Enclosure will eliminate noise down to 40 dBa ( Library Quiet ) so you can sit next to the enclosure and talk on the phone or have a conversation without the distraction of the printer noise. The enclosure is shipped in a specially designed box with excellent packing to keep the five plexiglass sheets intact no matter where we ship the unit. The assembly instructions are simple and the unit weighs less than 25 lbs assembled so it is easy to move. It can be assembled in under 45 minutes including removing the protective paper that is attached to both sides of each sheet of plexiglass. To date, LiteWorld has shipped over 50 of these new enclosures and the response from our customers has been terrific. 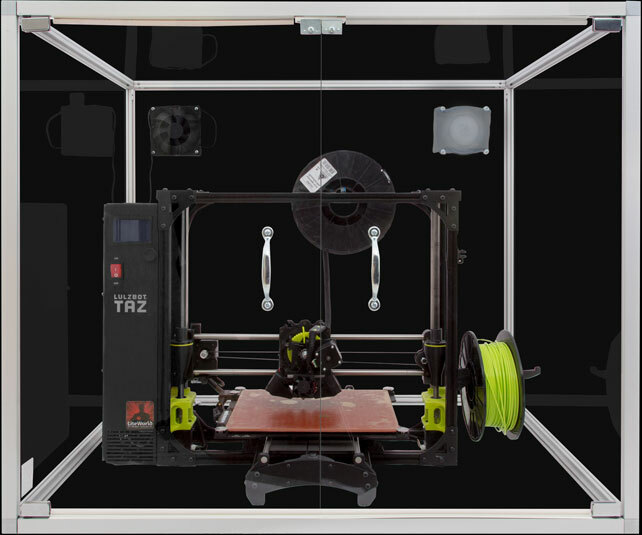 This in one of the only enclosures on the market that is big enough hold larger 3D Printers and still allow for all the access you will need to work with your printer.